Published on March 13, 2007 in Agenda, Booking, DJ, News, Site News. Bookmark the permalink. Yes yes! Friday the 23th of March we will be spinnin’ our hottest tracks once again! 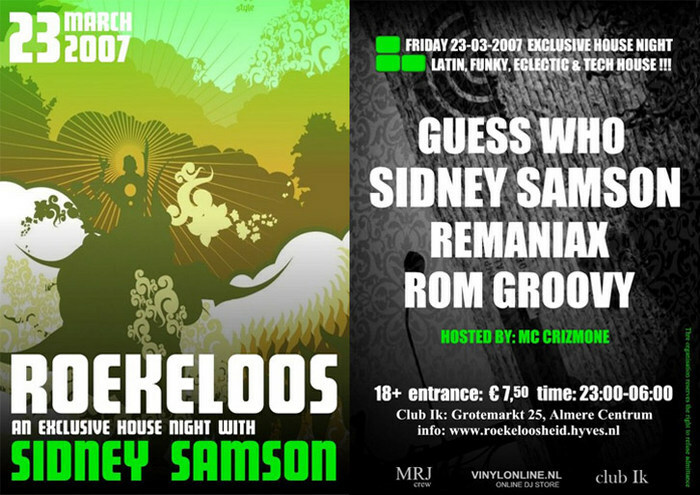 This time you can hear us at “Club Ik” (Almere) at the monthly returning house night “Roekeloos”. The rest of the night will be filled with residents Rom Groovy and Guess Who. Also the party will be joined by no other than national known dj Sidney Samson!